Children live in a hurry-up world of busy parents, school pressures, lengthy lessons, video games, shopping malls, and competitive sports. We usually don't think of these influences as stressful for our kids, but often they are. The bustling pace of our children's lives can have a profound effect on their innate joy and usually not for the better. Parents should recognize the several reasons why kids should practice yoga. 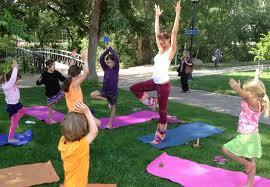 The sooner children become accustomed to yoga the better; as they will get the benefits that much sooner. Practicing at home with your kids will not only enable you to bond with them in a whole new way, yoga will also benefit your child’s life as greatly as they continue to grow. Yoga is a very gentle form of exercise and there is not much fear of injury or of overdoing it. Yoga moves beyond physical exercise and is a great tool for calming and controlling the mind and the senses. Yoga is best taught in school, but if your child's school doesn't than you can teach him at home. It serves a great way to bond with your child, too. Yoga for pre-school children develops body awareness, language, good listening skills, cooperation and powers of observation. It teaches pre-school children about nature, their environment and inspires their imaginations and creativity. With the help of mild breathing Yoga exercises, we are giving them tools to self-calm and to help themselves through anxious moments. It improves their self-esteem. Feel successful because they can do it to the best of their ability, irrespective of shape, weight or academic ability. Children can apply these skills in real life situations. Children improve their social skills because of the Yoga games which focus on teamwork, listening, cooperation and other social areas.